Oh, the dreaded Second Sock Syndrome. It hit me big time with this project. For readers who are not familiar with Second Sock Syndrome, it’s when you finish knitting one item in a pair then struggle to find the motivation to finish the second item. It can happen with socks, mittens, sleeves — anything that requires a set of two. Usually, my excitement over finishing a project overrides any lack of excitement I may feel about knitting the exact same thing a second time. And often there are little details that keep me interested, such as color changes or making a mirror image of the first item instead of a duplicate. Maybe there’s a stitch that I struggled with a little on the first go-round, and I’ve come up with a slightly different way to approach it. With my latest pair of socks, the second sock was finished through sheer stubbornness. 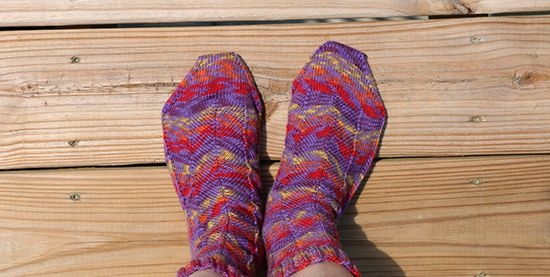 May I present to you my completed Jaywalker socks, which I described in my last two posts (see links at the end of this post). This time, Second Sock Syndrome had less to do with the project itself and more to do with the state of my life right now. A lot of my supplies and materials have been packed for about six months in order to minimize clutter while our house was on the market. Many of the items that weren’t packed away were essentially untouchable because we needed to have the house ready for a showing at any given time. Now I’m working on unpacking and organizing everything into our new home. Every time I open a box, my attention is pulled by another project that I want to make. My thoughts keep returning to the idea that if I make more projects, there will be less to pack the next time we move. Yes, my brain in conveniently forgetting that stash will be replenished and finished projects still take up space. At this point, most of the boxes are unpacked but few of the items are organized and put away. The available space isn’t necessarily smaller, but it is set up differently which requires a lot of thought to puzzle out how to make everything fit efficiently. In the meantime, I’m adding to my mental list of upcoming projects — and I don’t see socks anywhere on that list. Have you ever been struck by Second Sock Syndrome? What helps you overcome it? Oh this made me giggle, because my finish this Friday was also a victim of second sock syndrome - only in my case it took me 9 years to complete the finished pair!! My tactic, if it can be called one, was to put most of my yarn and fabric into storage to move house - and then it was all I had to knit!! Your jaywalkers are gorgeous and it is a stunning pattern, though I remember having to make myself keep going to finish my second sock too! I'm glad this gave you a giggle, Carie. Some projects are easier to get through than others! What a coincidence that these socks were also the product of a move. I'm currently suffering from Second Sock Syndrome. I've had it for six YEARS now!! I was in remission for a brief amount of time a few years ago, but the heel flap must have gotten the better of me. I'm really hoping this isn't a terminal case! The pattern takes more thought than I can give during Knit Group (and that's the ONLY time I knit these days.) Congrats! on beating your own Second Sock Syndrome. Thanks for the congrats! Six years is a long time, but I have faith that you can beat this!